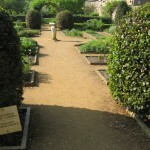 The long narrow garden consists of rooms. Some of which are decorative and others purposeful. 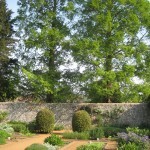 Two large naturally-grown trees beyond the stone wall guard and mirror two much smaller clipped sentries protecting the garden inside. 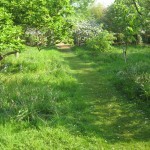 A mowed path through grass shows the way to transcending thought. The Petersfield Physic Garden shows how a delightful garden can both be stimulating for the spirit, pacifying for the mind and healing for the body. This entry was posted in The Grumpy Vegan Life and tagged Glimpses into the Private Life of the Grumpy Vegan, Why Britain Is Great. Bookmark the permalink.